Each of our products is elaborately designed and manufactured,We have a strict quality control system to ensure a stable quality.You will be 100% satisfied with our product! if you’re not completely satisfied you’ll be offered a prompt refund or replacement,no questions asked. The hand crafted nature of these journals means no two are quite the same. The soft brown leather gives a vintage look which is a truly unique and wonderful gift for a friend or to treat yourself to as a special keepsake. 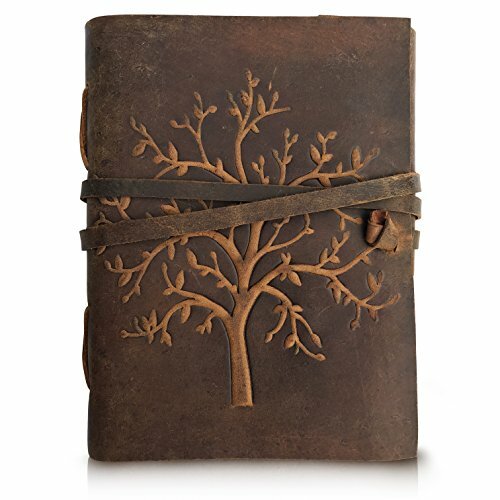 ✔ RUSTIC CHARM: Stunning Antique Tree Embossing on the front cover with a leather wrap around strap which effectively keeps your journal closed and also acts as a handy bookmark. Hand stitched Coptic leather binding which secures the pages firmly whilst adding to the vintage charm of our timeless journals. This old-fashioned character leather has an amazing smell! Large Storage Capacity:The jewelry box organizer designed with two layers to hold more jewelries and accessories. 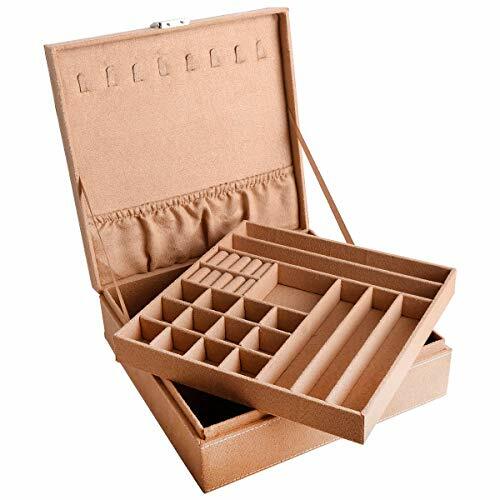 There are 27 compartments for storage your necklaces, rings, earrings, bracelets, etc. The difference size of the compartment will meet your needs. The second layer is designed with removable slot, it’s more flexible for uses. Great After-sale Service: We always focus on looking for items of elaborately designed and affordable price for customer. 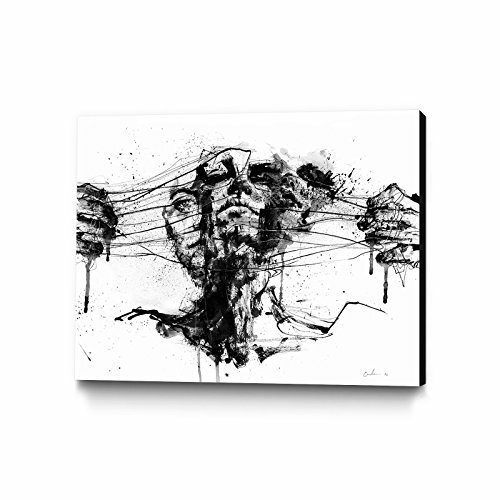 Please just feel free to contact us if there is any problem with your purchase. We will reply you in 12 hours and give you a satisfaction solution. 1. 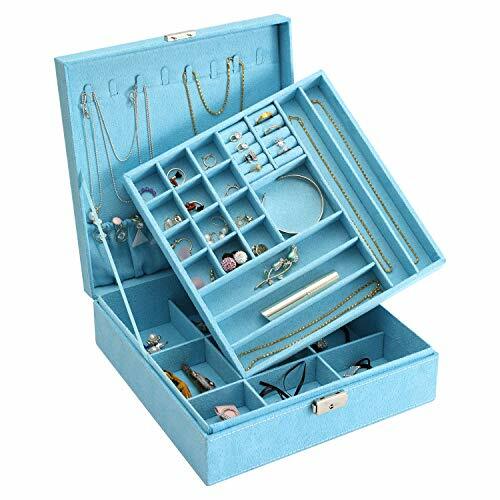 SPACE OF IT :26cm*26cm*8.5cm(10.2in*10.2in*3.3in).Double layer with 27 all kinds of space for rings、earrings、bracelet and ect.And 8 hooks are for necklaces.Sufficient space could meet the storage needs of all your jewelry. 2. MATERIAL:Being made of fiberboard,firm and lightweight.Covered by soft lint,beautiful and comfortable. 3. LOCK:These is a lock on it ,There’s a lock on top, and it’s better to close the box and keep the stuff from falling out. 4. With an elegant and simple appearance, it would be an excellent idea for a gift for personal use, retail display, and home decoration, compact size but have plenty of space for holding the jewelry such as rings, earrings, necklaces, bracelet and watches. 5. 100% Satisfaction Guaranteed: If there are any quality problems,we could give you a refund or change a new one for your. The perfect product, enjoy yourself, SKMMP will provide you with the best service! ♣ Price Match Guarantee, please rest assured to buy. ♣ For the same goods, we have better quality assurance. ♣ Our Product is 100% Handmade and Real Picture. ♣ The latest fashion design,quality after-sales service. ♣ The best gifts are handmade, and the best you deserve is the best gift. Ornament. Sun catcher. 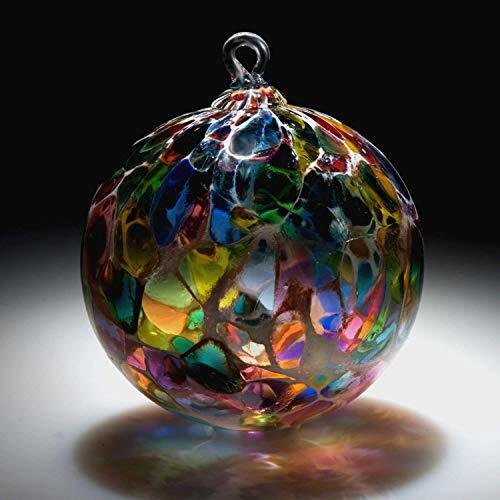 Hand blown Fine Art Glass Ornament in Magic White Powder Made in Seattle. Artist Dehanna Jones. Approximately 4″ diameter. With a clear loop for hanging. Great for any Holiday Tree or as a light catcher in a window. Each ornament is unique in the way the colors blend together. The art glass has a tendency to look completely different when rotated. Ornaments are made from the same color batch but may have a different distribution of colors and will vary slightly from each other. Cool looking in your Pendant or DIY Light Fixture. Great LED for retro-style fixture, great clear incandescent replacement. Classic Design with a amber glow to create a romantic atmosphere. 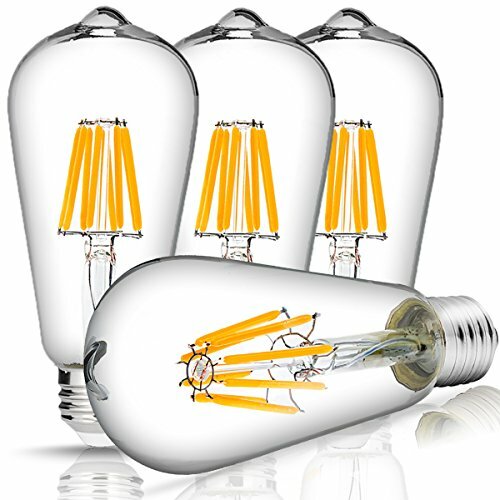 HIGH EFFECTIVE: 6W LED filament bulb replaces 60W incandescent bulb, save over 80% on electricity bill of lighting. NOSTALGIC FILAMENT: Dimmable vintage antique bulb with amber glow, squirrel cage style, standard (Medium) base E26 fit all home lighting. MAKE YOUR ROOM EVEN BRIGHTER: Output 600 lumens. High quality LED light source to create a unique atmosphere in your home, event or workspace. GREAT CHOICE FOR DECORATION: Average 30, 000 Hours Lifespan and one year warranty. MULTI-USE: Available in pendant light, ceiling fixtures, wall sconces, kitchen lighting, etc. These beautiful glass cylinder vases make excellent centerpieces for parties and are wonderful home decoration pieces. 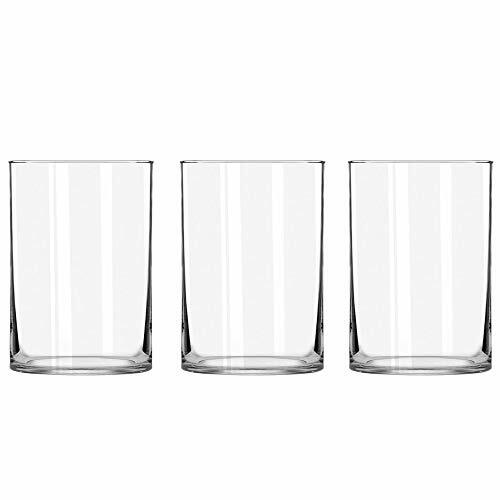 Package includ: 3 pack Clear glass cylinder vases. Dimensions:6 in height x 4 in diameter. Dishwasher safe.Can be filled with liquid, gemstones or rose petals. Safe Packing:Cover the vases individually with the cotton to lock the vase in place. Protect the vase in good condition. 【Stable And Durable Jewelry Cabinet】This jewelry cabinet is simple in shape and uses the MDF as main frame material. The frame is thick and with a certain strength . The bottom of the foot has a curved design. It can firmly grasp the ground and is very stable. After storing some items, it will not wobble easily. 【What Kind of Storage Space Do you Need?】Do you want to keep all items organized and full of different types of storage organizers? This one has super smart inside space to keep all your jewelry organized and neatly displayed. 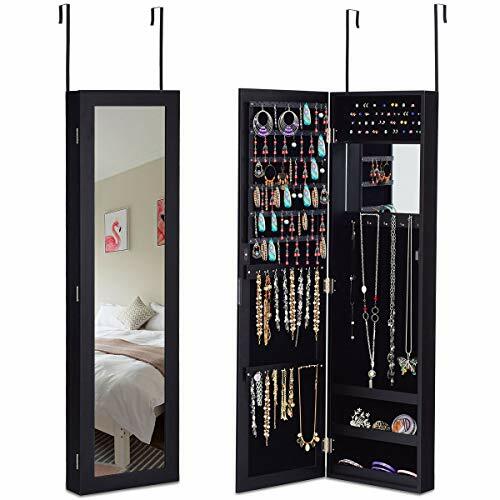 It includes 6 lined shelves designed for holding earrings, 25 hooks for necklace and bracelet, 4 rows of 40 ring slots, an inside makeup mirror.It helps you have a neat storage space and easy to find the right piece when you need it. 【Mold-Proof Surface Coating for Durability】Our MDF boards are specially customized. They are not ordinary materials in the market. They have good moisture resistance performance and the surface uses a very good quality coating. It is not only environmentally friendly, but also effectively prevents mold. Our coating is very smooth and looks very textured and you will be happy to receive it. 【Real Glass Full Body Mirror and Inside Makeup Mirror】This jewelry cabinet is a combination of a full-length mirror and a jewelry cabinet. It can be used as a mirror for you to dress. It can also be used as a practical jewelry cabinet to store your daily jewelry, giving you a clean and spacious space. Help you save money to buy another mirror. Besides, the inside mirror helps you have a clear reflection of yourself with the jewelrys on. You will love it. 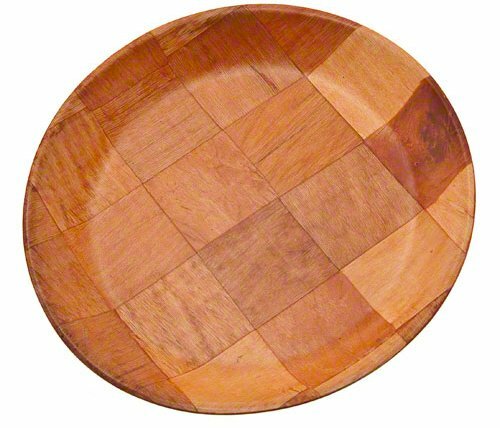 This round salad plate offer an unusual and earthy touch to the dining table. Made of woven wood material. Lightweight but are also resistant to scratches, breaking and tarnishing. Microwave and dishwasher safe. Measures 10-inch diameter.